After selling just 2000 copies of its HD DVD player, the DV-HD805, and discontinuing the system back in February, Onkyo has decided to have another stab at a HD system and is set to release a Blu-ray player in the tail-end of the year. Though details are sketchy – read: non-existent – the company has announced that the player has been designed to partner Onkyo's frankly brilliant AV receivers equipped with full HDMI processing of 1080p video and decoding of Dolby TrueHD and DTS-HD Master Audio surround sound formats. 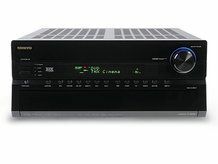 Although this is the first time Onkyo has delved into Blu-ray players, the company has be a forerunner in pushing Blu-ray's audio capabilities, with its AV receivers. The announcement of the yet-unnamed players comes just after the company unveiled its second generation AV receiver range, which houses the magnificent TX-NR05.